Indian summer means mangoes everywhere. Green mangoes, yellow mangoes, red tipped mangoes, round mangoes, oblong mangoes. Mangoes and more mangoes. Time to eat them now and to preserve them for the coming days. 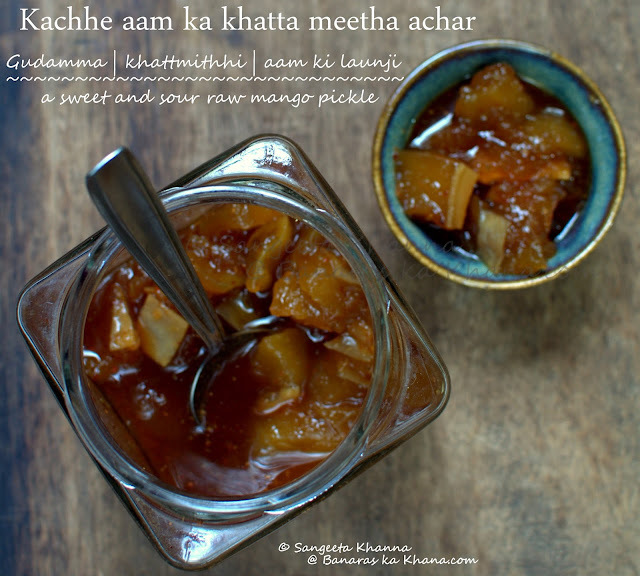 This khatta meetha achar is a traditional UP preserve called khatmithhi, gudamma (gud is jaggery n the name suggests gud + aam) and paagey aam (meaning mangoes in sugar syrup). Call it by any other name, it is the hot favorite khatta meetha aam much like a gujrati chhunda and is a must do in this season. For the last two years I am gifting a small jar of this to one of my neighbors as she likes it very much and this time when she asked about the recipe I decided to post it here. 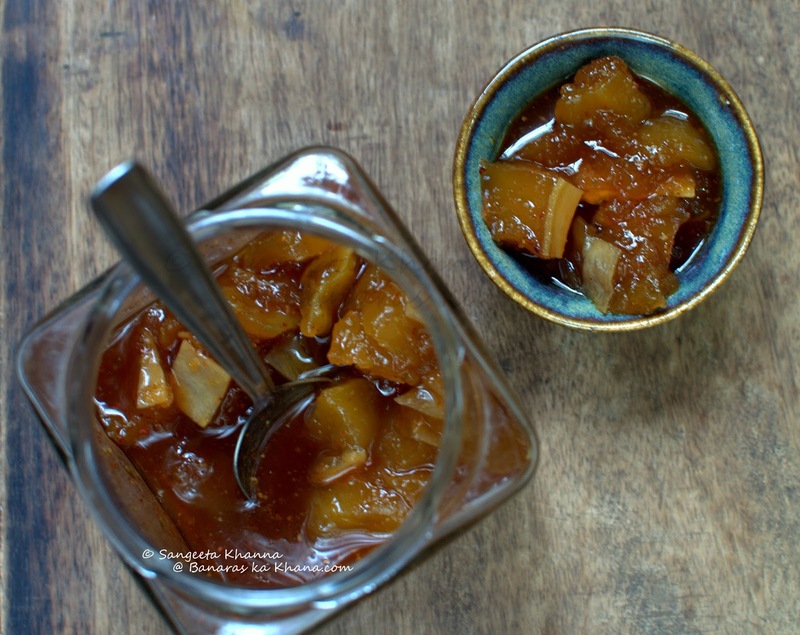 You need raw mangoes for this preserve and if you do not find perfectly raw white flesh mangoes, you can go ahead with the yellowish flesh raw mangoes, it should be sour in taste so that khatta meetha (sweet n sour) taste is done justice with. 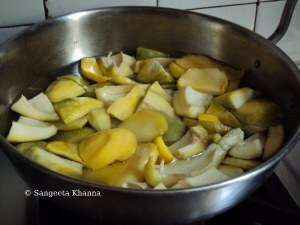 If the mangoes are very firm and raw it will result in perfectly shaped firm pieces after cooking and if the mangoes are half ripe or slippery while cutting pieces you may end up with a mushy textured preserve. The good thing is, it does not affect the taste or shelf life of this preserve, so go ahead with making this preserve with whatever type of raw and sour mangoes are available in your part of the world. It's a step by step procedure and i think it will be easy even for a first timer to make it perfectly. Dry roast the fenugreek, fennel seeds and red chillies in a pan and powder them in the spice grinder. Keep aside. Peel the raw mangoes with a potato peeler, cut them into 8 pieces and discard the cotyledons, keeping the hard seed coat intact. Mix with the sugar and water in a stainless steel pan and start cooking. Add the spice mix and stir to mix properly, so that the spices release their flavor in the hot and sour syrup. Put off the flame and fill the preserve in sterilized glass jars. It can be made thinner (with lesser sugar) to consume within a few days as it keeps in the fridge for a week or so. 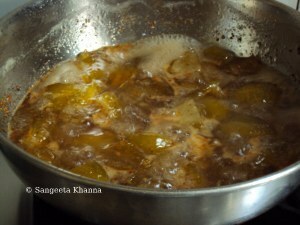 The preserve is quite sticky and is a common accompaniment of a simple daal chawal lunch during this season. It is made in Bengali families too and they call it aamer chaatni every family may have their own version but I found one thing very interesting that the sweet chaatni is served in the end of the meal ,just before the dessert in Bengali meals. The chaatni is not eaten along with the meal as it is done in UP families. Most UP homes will serve this gudamma with every meal during summers. Some people even mix this pickle with daal chawal and eat as a mix which I find repulsive somehow, but it just shows how much people love this khatta meetha aam ka achar. Gudamma or khattmithhi as you may call it. This is my all time favorite in summer time. In fact I am eating it since I am back. Ohhh remember gudamma...my grandma made it every season by season....thks for sharing Sangeeta n also for refreshing my childhood memories. 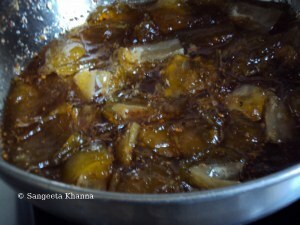 Sangeeta i just luv this khatta-meetha achar...i like to hv it specially with tehri...my mommy always make it just for me. Looks delicious and perfect with parathas and puris. 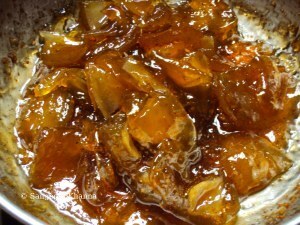 OMG Sangeetha..My naniji(grandma) used to make this achar..Ur make me nostalgic..She used to make all kinds of pickles for us and we used to eat thema ll when we visited her for our summer vacation..Love ur step by step directions.. Awesome achar..thoda khatta thoda meetha..Maza aa gaya..thanks for sharing this recipe. Yes , this achar is such a popular thing n such a childhood favorite with all of us.....i will keep reminding you all of you daadi n naani in my posts ...that is for sure. I am so smitten by the traditional food that every time i have to choose what to post from my collection of drafts ( i am very slow in posting my recipes n they wait in drafts for months sometime ), i select the time tested favorites. i too want a bottle! i love khatta meetha aam chutney! i never realised mango chutney is so popular outside india!! firangis, particularly brits love it and is a staple with north indian food here in the emirates! Hi Fariha, I know how a UPite can be nostalgic abut this achaar. Why don't you try making it yourself now? It's not that difficult. My mouth is watering like anything.I want to eat this.Will hop to the market today and will get the raw mangoes.Had raw mango dal today for lunch. It would help knowing how you want them to be used Fariha. Like if you want them to preserve for later use you can just chop them and freeze. 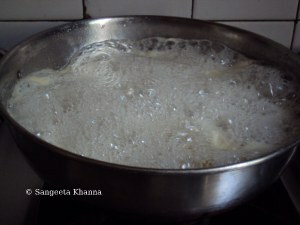 Later it can be used to make kulfis, Ice creams and even the cheesecakes that I have posted on HFDV. 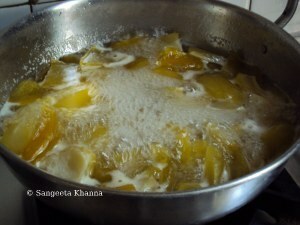 If you want to make aam pappad or fruit leather you can always do that. A procedure I am going to post this season positively, I make it every year but somehow it does not get posted. If you want to make something for the current season, you might think of making some cakes or pancakes with them. jam will be a good idea if your family loves them. let me know what do you want, may be I'll post a recipe or ideas around it. You are mot welcome Fariha. Hope the links in the mail are useful for you. Yes I do a aam panna concentrate but that is without any preservatives and needs refrigeration, lasts for 2 weeks maximum. Will post the recipe very soon. This achar sya for a year if you cook it to the consistency shown. It looks glazed and shiny when done. To be doubly sure, use about 500 gm sugar per kilo of raw mangoes.